We were lucky enough to have a personal visit from David Crystal who will sign in our bookshop in March 2017. 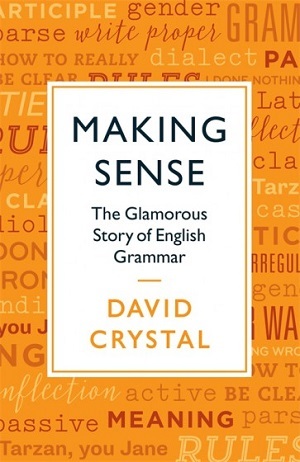 David Crystal explains grammar’s rules and irregularities, shows how to navigate its snares and pitfalls, and explores its history and varieties. He gives practical guidance on how grammar may be used for different purposes and in different settings. He provides a series of insights into the stages by which children acquire grammar and shows how this can be used to guide its early instruction. He casts a mordant eye on what learned people have said about English grammar over the centuries and what they continue to say now. People have always been uneasy about points of grammar and worried that what they say may not always be what they mean. Grammar is complex but, Professor Crystal shows, it need not be daunting: the more we understand it, he argues, the more sense we shall make. Making Sense is as entertaining as it is instructive. David Crystal unites investigations of its nature, variations, history, learning, and teaching with a host of practical advice. Like its three companion volumes it will appeal to everyone interested in the English language and how to use it.